Summer is always the best time of the year. The weather is always warm, attractive, and very pleasant to the skin. It is a season that everyone delights in. As you get your wardrobe ready for summer, it is also very vital that you have your hair done wonderfully. It will give you that edge that you need to have in the hot summer weather. The way you wear your hair will have a great impact on how you will look. There are numerous hairdos but there are those that are best fitted for summer. They are stylish, fancy, edgy, breathable, and sassy. Therefore, every woman should always consider the hairdo that will give them an easy time under the sun. There are a few summer hairstyles for women that I recommend and love. These hairstyles will have you looking your best. They are easy, fast, and maintainable. This hairstyle is loose, stylish, and edgy. It has that carefree attitude that comes with the hot summer. The bun is tied at the top of the head and the fishtail braid adds to its beauty. This hairstyle is messy and it has the touch of personality to it. You can add to this hairdo the perfect hair band. Pair it up with sunglasses when you go to the beach or when taking a stroll. Blonde will always look good in summer without a doubt. This hairstyle gives your hair the freedom it needs to move around with every head turn. Because of this freedom, it is easy for the cold breeze to pass through the strands giving you a refreshed feel. The light waves are perfect same as its length. The medium length means that you will not suffer under the heat because the hair will not be covering you so much. A top knot will always work wonderfully well during summer. It gets all the hair out of the way and makes it easy to enjoy any breeze that may blow around. When you are done preparing your hair by applying your hair products, comb it upwards and tie a knot. 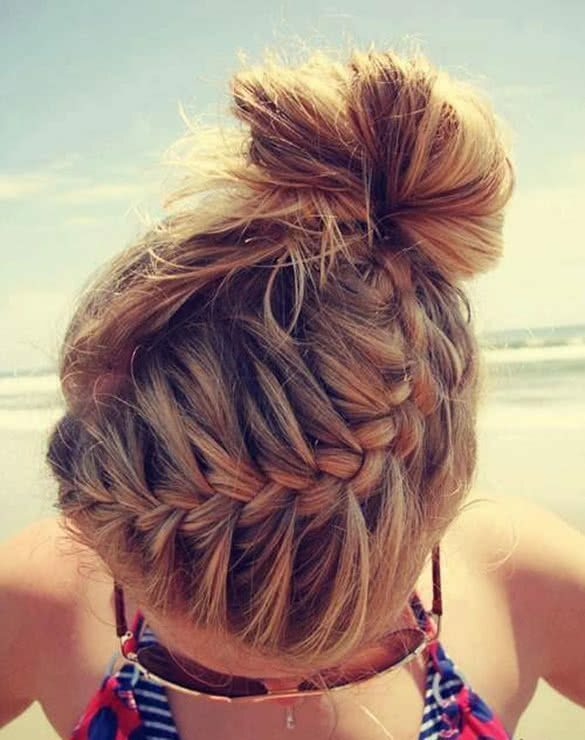 Braid the hanging hair and create a bun. This hairstyle is simple and very neat. It has a perfect finish. The pull through braid is increasing in popularity day after day. It has made work easy for us because you do not have to worry about not knowing how to braid. This cheat braid only requires hair bands and hair clips. All you have to do is learn the tricks involved. 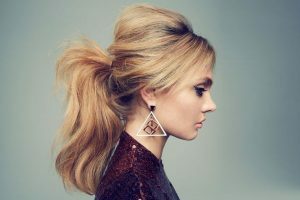 They include the partitioning of hair, tying a band over it, parting the ponytail into two, running the two partitions under the second ponytail, and tying it up with the third ponytail. Repeat the process to the end. It is a sassy and edgy look for summer. Do not forget your hair products. Brunette hair is also a great hair color for summer. When you have dark brown eyes, then this look will be the perfect look. The length of the hair is perfect. It will not trap any heat over you. It is simple yet sophisticated and very attractive. Spray a good hairspray or apply any other product of your liking and give it a nice brushing. This look is perfect for the office and any other place. Bandanas never truly leave our fashion scenes. Even if they go out of fashion, they will always find their way back to the scene.Is there a better way to have your hair under control when you do not want to tie it down than using a bandana? The hair color, the waves, and the length are perfect. The bandana gives it an edge. It is a perfect style when you are out and about. Use the perfect hair product to give it that amazing glow. This French braid top knot is simple, edgy, a bit messy, and gorgeous. It is the perfect hairdo when all you want is to lay back and relax. You can have someone to do the French braid for you as it can be difficult for your hands to reach your back comfortably. Tie the knot at the top of your head and tuck the hanging hair. The loose waves are perfect and give great room for the air to circulate under the hair. The length is amazing and the golden color is spectacular. You can have any color as well. Even so, this color has a lot of life in it. It is simple and with a great personality. It is perfect for sleeveless clothes, bare backs, and so on. If you are looking for unique, edgy, stylish, and gorgeous, this is the hairstyle for you. The side fishtail braids are excellently done and they flatter the look. The length of the hair is perfect as it gives you the perfect ponytail. Tying the hair at the top of your head can also work but not as good as when it is at the back of the head. This hairstyle gives you that ancient feel and a taste of what the Greek had back then. You need perfect hair length with beautiful waves. You will also need a pair of braids that will act as your headband. The hair color can always vary depending on the individual. It is elegant, sassy, and unique. This hairdo is messy, edgy and very beautiful. All you have to is make a French braid in the shape of a curve starting from one side and it should end up at the top of your head. Comb the rest of the hair at the back upwards and tie it with a band. Tuck all the hair so that there is nothing left hanging. This summer look is perfect and makes you more of a queen. The braiding is done around the head so that it can look like a crown. It is perfect for getting all the hair out of your way. It is beautiful and very elegant. Indeed, this hairdo is sleek. Get your comb, your gel, wax, pomade, or hairspray,and a hair band. Part your hair in two sections from the center of your head. Let the line be straight, visible, and up to a third of your head length from front to back. Apply your hair product and give it a nice brushing. Hold it down using your hair band, clip, or pin. This is a perfect hairdo for any occasion whether official or casual. It is neat, sophisticated, and stylish. The retro waves give it the touch of elegance. The hair color and length can be different for everyone. Use a hair product that will give the hair great shine and illusion for volume. One thing you cannot miss for this hairdo is a number of hairpins. This hairdo is easy and is very sleek. Brush your hair upwards and tie a Coachella knot at the top of your head. Place the hairpins at the back of your head to form letter ‘V’. This is a neat look that can work for official functions. The simplicity of this hairdo is very convenient. It is a beautiful, simple, and amazing look. All you will need is your hair products and a hair band to hold the hair at the back of your head. There are numerous variations for the wispy hairdo and people can work with different lengths. In all these variations, there is a great beauty. Beehives will never go out of fashion. They are elegant, stylish, trendy, and sophisticated. They come in numerous designs but the essence is always maintained. This look is elegant and perfect for all kinds of functions. You will need hairpins and clips for securing the hair in place as well as other few supplies. Brush your hair upwards then starts on creating the perfect beehive. Wear it with something that flatters your beautiful neck and shoulders. For this hairstyle, separate the hair at the top of your head from the hair at the back and the sides using a comb. Using a band, create a bun. Leave the rest of the hair to fall perfectly on your skin. The length of the hair is perfect but can also vary in length. The beach waves are perfect and add a lot of character to the style. With the perfect chunky neck piece, you will look stylish and elegant. These summer hairstyles for women are excellent and very gorgeous. They add a lot of personality to your look and they are very edgy. 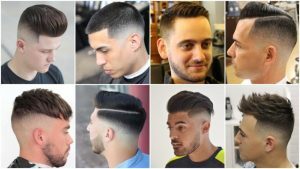 They are hairstyles that you will not go wrong when you try them. They are perfect for every woman.